New Life Counselling is a voluntary counselling organisation committed to supporting the emotional health and wellbeing needs of its clients through the provision of counselling. We provide friendly and professional counselling services for children, young people, adults and families. The service is open to anyone regardless of gender, age (5 yrs +), religion, sexual orientation, ethnic or cultural background. Our facilities are also designed to promote disabled access and we offer a tailored counselling service for the deaf community. To support people to achieve their personal potential through professional counselling and therapeutic services. Our vision of the future is one where society actively promotes positive emotional health and wellbeing, gives everyone the freedom to grow and provides access to excellent counselling and therapeutic support services when needed. New Life Counselling is a voluntary counselling organisation committed to supporting the emotional health and wellbeing needs of its clients through the provision of counselling and therapeutic services. 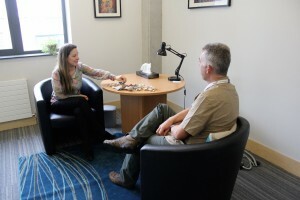 New Life Counselling provides counselling services for children, young people, adults and families.